Anyway, it looks pretty nice and I'm wondering how long it'll be - minutes? Days? Is it already too late? - before someone puts a video with them (or their stop-motion model figures) performing the full version of the dance! OverCoat edit: Need less suspicious .exe installers? Try youtube! mDuo13 Edit: Youtube link updated. So the outlook is: if you liked Madlax and/or Noir, El Cazador sounds great. It seems that Mashimo is being sure to hit a variety of locales: Noir took place mostly in France, Madlax mostly in southeast Asia, and this one will be somewhere in the Wild West or South America. If you couldn't deal with the convoluted, style-over-substance plots of the first two series, you'll probably hate this show, too... but I'm telling you right now, the soundtrack is probably going to seriously rock. There's another Bee Train + Yuki Kajiura anime for this spring, the third season of Tsubsa Chronicle, a show whose plot I've learned to despise, but whose soundtrack continues to expand with amazing music. (More on that later.) In any case, the series will pick up where it left off and with any luck it won't get renewed for another agonizingly progress-less season, but one has to worry about these things. It seems impossible that they'd change composers, though, so if you're a Kajiura fan, keep an eye out: this should be good. There are some other upcoming anime worth noting, though not for their music. There's "Kishin Taisen Gigantic Formula", a mecha anime with designs by people from pretty much every mech anime ever. Take a gander at the list: Ikuto Yamashita (Evangelion, Blue Sub #6), Yutaka Izubuchi (Patlabor, RahXephon), Yasuhiro Moriki (Nadesico, Crest of the Stars), Takeshi Takakura (Appleseed), Shoji Kawamori (Macross, Escaflowne), Shinji Aramaki (Bubblegum Crisis), Shingo Takeba (Pilot Candidate), Kunio Okawara (Gundam series), Kimitoshi Yamane (Gundam Seed, Cowboy Bebop), Kazutaka Miyatake (Macross Plus, My-HIME), Kazumi Fujita (Zeta Gundam), Kanetake Ebikawa (Fullmetal Panic, Eureka 7), and newcomer Katsushi Murakami. Apparently each of them is designing one mech to represent one country in a massive battle for dominance in a post-apocalyptic world. Or something like that. There are mass murders and catastrophes all over Japan, committed by a masked/caped psychic madman called the Skull Man, and his shape-shifting aide Garo, who can turn into various powerful mutant monsters. The calamities caused by the Skull Man are investigated by the Tachiki Detective Agency, with the help of a young man named Tatsuo Kagura, the son of a yakuza in the Kagura Clan. P.S. if you're a fan of Taku Iwasaki, apparently he did the soundtrack for a movie that just premiered in Japan, entitled "Origin ~Spirits of the Past~". Unfortunately, I don't know anything about it. I'll keep you posted. 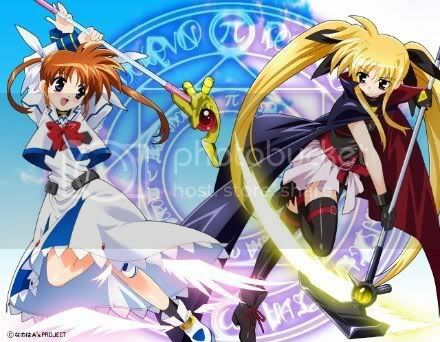 Lately, I've had the chance to watch a not-so-recent series called Mahou shoujo lyrical Nanoha. Obviously, it is yet another magical girls show and it might scare most anime viewer with its extreme cheesyness. But fear not, young otaku, it's actually better than it sounds. Takamachi Nanoha is a young girl (about 12 years old?) who lives a normal life with her family. Suddenly, one day, she meets a small ferret who gives her a magical jewel and tells her that they must find the magical jewel seeds before they destroy the world. Up to now, that's pretty cliché and rather uninteresting, but what is interesting with Nanoha is everything around the story. The animation is very well done. There is a scene in episode 1 which probably stands as one of the best scenes I ever saw in an anime, animationwise. The characters themselves are really well detailed and well... loliness = win in my book XD. Fortunately for the story, it evolves into rather unexpected ways. It even goes into science-fiction territory at some points. Yet, when you reach episode 9, you can pretty much predict what is going to happen until the end. Another interesting element in nanoha is the way the characters fight. Fights in Nanoha usually have a bunch of big explosions and special moves, reminiscent of mecha anime. Some battles even last for more than half an episode (especially in the second season). In a sense, this is the beauty of Nanoha: it can cater to many kinds of audience. 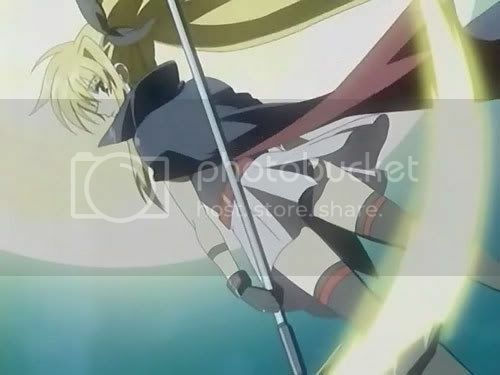 Nanoha is very conservative with it's music, with more classical music and, at some times, piano reminiscent of the Melody of Oblivion soundtrack. Sorry, there's not much for the electric guitar and drum freaks. Both first and second season openings are performed by Nana Mizuki, and both endings are performed Yukari Tamura. While the openings are really good (especially the second one), I do believe that the endings are a bit too childish though, at least for my taste. There is not much more to say about Nanoha. It's a rather cheesy anime which has some nice moments. As I usually describe it to my friends "It's a mecha anime where the mechas are disguised as little girls and fight for love, justice and freedom". It's definitely worth your time if you can laugh at it, instead of finding the whole "becoming friend with the whole world" principle annoying.